Offering you a complete choice of products which include pvc fills. Banking on our enriched industry experience, we are engaged in offering a huge gamut of PVC Fills.Our standard fill is constructed of a honeycombed PVC film. 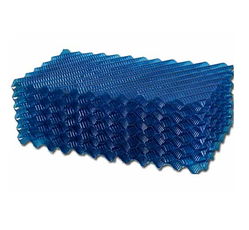 This honeycomb construction ensures even water distribution and high-efficiency water to air heat transfer. The PVC fill shall withstand a maximum inlet water temperature of 55°C. We can supply HIPS and ABS fills for high-temperature application up to 100°C.